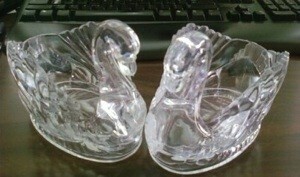 I have these clear plastic swans and I am looking for ideas to use them for a anniversary party. They measure 4 in. tall by 5.5 in. long in a oval shape and 4 in. across. They are quite big. Any ideas would be helpful be it favors, centerpiece or whatever you may think of. I have 61 that were given to me and I am trying to see what can be done with them.